A $200 security deposit will be required on checkin and will be refunded on checkout assuming the room is left in an acceptable state. If a group want only their group in Dorm rooms they will be required to pay for each bed in that room. i.e. the group want 5 persons in a 6 person room they are required to pay for the 6th bed unless the hostel is at liberty to put other into that bed. Are you an adventurer? are you looking for the best located hostel in the city? are you looking for a hostel that can cater for your every need? do you like free and fun daily activities? Well look no further as you'll find base is an amazing place to stay, run by like minded people in an environment where you'll feel right at home. 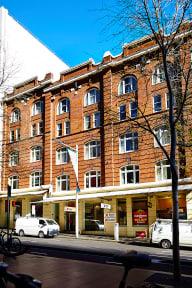 Base Sydney is Sydney's most centrally located budget accommodation venue, So said the Lonely Planet guide book. Spend some time staying with us and you will understand why base Sydney is the place where the coolest and funkiest people in Sydney hang out. Transport to Bondi Beach, the SCG and Telstra Stadium is just across the street at Town Hall Station with the historic Rocks precinct, Sydney Harbor Bridge and Opera House are just at the end of the street. Exclusive to Base is The Sanctuary an innovative & luxurious girls only floor with high quality facilities, safety and home comforts including FREE Shampoo and Conditioner and FREE use of hair dryers and straighteners. Just make sure you ask at reception! Make sure your around for our famous Wednesday Night Theme Party Nights! What a great place :) Checked in and made a meal, kitchen is reasonably sized and basic. Was clean at dinner time which is good. Had an en suite bathroom in a mixed dorm, some guy had shaved and left his face things in the sink, it was cleaned in the morning by the cleaning staff. Over all, had a lot of fun and went on the walking tour around the corner, would highly recommend. Staff happy and helpful. Great events planned - loved wet Wednesday. Good kitchen space and plenty of toilet and shower facilities which meant we never waited. Room really nice and clean, big lockers available. Central to so many things, liked surrounding bars and shops. Close to train station and close to Bondi and Coogee beach via bus. You’d be silly to miss out on staying here, we wanna come back! Vibrant place and nice atmosphere. Though there was a slight issue with the reservation, it was promptly solved by the staff. The room is clean and well maintained. I recommend it to anyone looking for accommodation in Sydney CBD. Staff is amazing! Location is perfect. And it's clean. Not much to say about the hostel itself But the staff was rly remarkable! I needed help to book the rest of my trip & Noel helped me out beyond what I could even imagine! He RLY took the time to ask me what I wanted out of my trip & found the perfect way to itinerary for me. He helped me book everything & I barely had to lift a finger. Rly thankful for that! Location was perfect. I stayed in the female dorm which was tidy and spacious with lots of lockers for your stuff. Cleanliness was good for a big hostel, although bathrooms got messy over the day. The social area wasn’t great for socialising or meeting new people as there wasn’t a good quiet space for it and it felt cliquey. The staff were friendly but so pushy to book trips and when I asked them about other trips they weren’t very helpful. Overall I’d stay again but not great for solo travel. Staff was very friendly and the location was great. However, the bathrooms were a mess, and the door to my room didn't lock properly. Additionally, the checkin process (where they give you a pin instead of a key) was a big hassle. Some staff were amazing and others were uninformed and unwelcoming. Bathrooms completely flooded the first couple days and there wasn’t any information of what was happening. Nights can be really loud depending on what floor you’re put on because of the bar downstairs. Not really a good quiet area to hangout or chat, the common room always has loudish music playing. Overall don’t think it’s worth what I was paying, but obviously certain days and times of the year are cheaper. Stayed in Sanctuary room. Storage in room was great. Plugs are rubbish for top bunk beds. Toilets/shower are filthy. The tipi app to get in the room is temperamental. Staff are pretty useless unless you want book a trip. They ask the most ridiculous question. Whilst stood with backpack on, they asked are you travelling? The kitchen is large, dirty and noisy. Groups of people competing to be the loudest with their music and beer pong.